Ightermurragh Castle is a Stuart era ‘stronghouse’ built in 1641 by Edmund Supple and Margaret Fitzgerald ‘whom love binds as one.’ It remains one of the best preserved fortified houses in County Cork. The view shows the castle from the south-east, with the main entrance in the projecting wing. The original armorial over the door is long gone. Note the windows on the east wall, which gave a view of the formal garden. In the barony of Imokilly, the local road R633 leads from Ladysbridge to Ballymacoda by way of the ancient parish of Ightermurragh. There is an old graveyard on the southern side of the road. Inside this enclosure there are scant remains of the seventeenth century church which stood there. There had been an earlier medieval chapel dedicated to the St Mary the Virgin which was subordinate to the College of Youghal. It seems likely that the chapel took its dedication from the Collegiate Church of St Mary at Youghal. However a new church seems to have been built following Ightermurragh’s erection as a separate parish in 1637. The creation of a separate parish with a new church at Ightermurragh was part of the attempt by the reformed Established Church to make a firm imprint on East Cork in the early seventeenth century. The nearby church of Kilcredan was also built in the early 1600s as perhaps the earliest purpose-built Protestant church in East Cork. The small graveyard of Ightermurragh where the Protestant church erected in 1637 once stood. This date is interesting because it suggests a link to the erection of a fortified house within sight – Ightermurragh Castle. What makes this juxtaposition so interesting is that although the church was built by the Established Church, the ‘castle’ was built by a man described as ‘Ir papist’ in the Down Survey. – the builder of the ‘very fayre large House’ was an Irish Catholic. The same Down Survey text says that the church was ‘demolished’. Even more interesting is the proximity of Ightermurragh Castle to the Fitzgerald’s Castle Richard (Inchinacrenagh) across the Womanagh River.which runs from west to east from near Cloyne to debouch into Youghal Bay near Ballymacoda. With the most unfortunate timing, the fortified house at Ightermurragh was built in 1641 by the seemingly happily married Edmund Supple and his wife Margaret Fitzgerald ‘whom love binds as one‘ as proclaimed by the Latin inscription over the principal fireplace on the ground floor. They built a four square three story block of rubble limestone with basement and attics. The main block runs east-west with a square, full height, central projection on the south front to house the arched entrance door. The north front is similar, but it housed the ‘back door’ or servant’s door at the foot of the wooden staircase that rose the full height of the building. The different floors are identified on the exterior by string courses. The windows are square stone mullioned openings of various sizes with hood mouldings. They are entirely typical of the early seventeenth century architecture of early Stuart Ireland. The house had seven tall chimneys with corresponding fine fireplaces in various rooms of the house from the ground floor to the second floor. There was one oddity of Ightermurragh worth remarking on. When we build houses in Ireland today, we like to have the largest windows on the south west to capture the best of the day’s light. But when Edmund and Margaret built their new house, the best views were to the east over what appears to have been a walled garden. The entire west gable end was built without a single window. Indeed this end of the house consists of a huge chimney fed by the vast kitchen fireplace in the basement and by another fireplace on each of the first and the second floors. Ightermurragh viewed from the south-west showing the entirely windowless west gable wall. This wall consists of a single great chimney. Note the box machicolation over the entrance door – and indication of the often unsettled conditions of early modern Imokilly. Ightermurragh is the best preserved seventeenth century fortified house in East Cork. It lacks just the roof and the internal timber floors and partitions. Oh, and the leaded glass casements are gone from the stone-mullioned windows too. In all, Ightermurragh must have been one of the best houses built in Imokilly before the Cromwellian invasion. It was clearly a modern, well built, well lit house with plenty of heating available from its numerous fireplaces. However Ightermurragh also looked backwards – it was a defended or fortified house. The principal entrance was protected by a ‘box machicolation’ on the parapet. This parapet ran all around the top of the house. There were holes for muskets to protect the entrance and other parts of the house. It should be recalled that there were no police to keep order when robbers attacked a dwelling. Alas, Edmund Supple and his wife, Margaret Fitzgerald, had little time to enjoy their fine house. In 1642, the Great Catholic Rebellion had spread countrywide to all parts of Ireland….although Imokilly was relatively quiet until 1645. One night, Edmund, Margaret and their little child had to flee in the face of serious armed threats, presumably from the Protestant forces in Cork led by Lord Inchquin and Lord Broghill. With the Cromwellian settlement of 1653, Roger Boyle, Lord Broghill who was now Lord President of Munster, awarded himself the Fitzgerald lands of Castlemartyr and also took for himself Ightermurragh. – the Ightermurragh holding was some 620 acres spread over five townlands. With the Restoration in 1660, the Supples tried to recover their lands by a lawsuit. However, Boyle, now Earl of Orrery, was to entrenched to be moved. The inner face of the west gable wall displays the huge kitchen fireplace (which has a bread oven) in the basement, with a small ruined fireplace on the first floor and a fine preserved fireplace on the second floor. Note the complete lack of windows on this wall. By 1750 Ightermurragh was leased to a gentleman called Smith . He had a most unfortunate experience one night. Some robbers, apparently from Cloyne, got into the castle and began to threaten Smith to make him divulge his money. He gave was money he had in the house at the time but it wasn’t enough. It appears that Smith was really a farmer and not a particularly wealthy man. Failing to find any further money in their search of the house, the gang took Smith down to the kitchen. There they tied him to the spit in the huge fireplace – it was big enough to roast a whole ox. Smith was roasted over his own kitchen fire until the robbers were finally convinced that he had no more money in the house. With dawn approaching, the robbers grabbed their loot and fled into the darkness. Poor Smith finally got himself untied from the kitchen spit and, severely traumatised by his experience, fled to his relatives in Rathcoursey. It would seem that the robbers were never identified, caught or punished. It seems an appropriate story to recount at Halloween. After this, Ightermurragh was abandoned although the Earl of Shannon, Boyle’s successor, did try to prevent the locals from looting the stonework in the later 19th century. Ightermurragh stands today as a gaunt reminder of how promise could turn sour in a very short time. A short course in Family History is available in the night school at St Colman’s Community College, Midleton, from 30th January 2018. The course runs for six weeks, with two hours of class every Tuesday night, from 7.30 pm to 9.30pm. This is a practical course designed to show you how to research and how to overcome some ‘brick walls’ inhibiting your research. The cost advertised by the school is 80.00 Euro. It was a tradition in Ireland on Christmas Eve to light a candle and place it in a window to light the way for the Holy Family and Christ Child. The candle was lit by the youngest members of the household and kept alight all night. With the advent of electric candles, this tradition is now being revived. Wishing you all a very happy, and peaceful Christmas and a healthy and prosperous New Year. Alan Brodrick (1656-1727), 1st Baron Brodrick of Midleton and 1st Viscount Midleton, former Speaker of the Irish House of Commons, Lord Chancellor of Ireland. Jonathan Swift, born 350 years ago, knew an irascible character when it met one – after all Swift was himself a quite difficult character when it suited him. His description of Alan Brodrick as being as ‘violent as a tiger’ is a case in point. It took one to know one. However, Swift was not saying that Brodrick was a physically violent man, but that the language Brodrick employed in law and politics was often intemperate. Alan Brodrick was the second son of Sir St John Brodrick and his wife Alice Clayton. He was almost certainly born in Ireland in 1656 – just as the Down Survey was being compiled. Sir St John had been granted large estates in Ireland under the Protectorate (Oliver Cromwell’s Commonwealth). These were centred on the market-town of Corabbey, which was renamed Midleton in 1670. Alan was educated in Magdalen College, Oxford, and later at Middle Temple, one of the Inns of Court in London. Brodrick was called to the English Bar in 1678. This automatically entitled him to practice as a lawyer in Ireland. Almost certainly, Alan was being set up for a legal career – necessary due to his older brother Thomas being their father’s principal heir. Under the rules of primogeniture, Thomas stood to inherit all of the Brodrick estate in Ireland. Alan Brodrick was sent to Magdalen College, Oxford, for his education. However, Alan would go on to create his own estate. When James II came to Ireland to fight for his throne against his son-in-law, William, Prince of Orange, in 1689. James’s Irish parliament attainted the Brodricks, who fled to England and gave their support to William. On returning to Ireland following the Battle of the Boyne in 1690, Alan was made Recorder of Cork. This meant that Alan was now the principal magistrate in Cork, the most important judicial office in the city. and he was responsible for keeping law and order in the city. Alan was also appointed Third Serjeant (a legal office) in 1691, but was dismissed in a few months as there was no work for him to do, as he admitted himself, although he complained bitterly! Alan Brodrick was appointed Solicitor General for Ireland in 1695, a post he held until 1704. He was appointed Attorney General for Ireland from 1707 to 1709. In 1710, Alan became the Lord Chief Justice of Ireland – this meant that he was the head of the Court of Queen’s Bench. However he was removed from office by the government for his disagreements over policy. William of Orange and Princess Mary accept the crown following William’s successful invasion of England in 1688. Brodrick was elected to the Irish House of Commons in 1695 as MP for Cork city, a post he held until 1710. In 1703, he was elected Speaker of the Irish House of Commons, but had to step down in 1710 when he was appointed a judge. Elected MP for Cork County in 1713, Brodrick was immediately chosen to be Speaker of the Irish Commons again. As an MP Alan Brodrick was instrumental in framing the notorious Penal Laws against Catholics and Jacobites. From 1695 a series of punitive penal laws was passed in Ireland to prevent Catholics from challenging the Established order. The accession of King George I, a descendant of King James I, in 1714 led to Alan Brodrick being appointed Lord Chancellor of Ireland. , Alan Brodrick, Baron Brodrick of Midleton, Lord Chancellor of Ireland, was elevated as Viscount Midleton. This, presumably, was a sort of bribe to a difficult political character, to keep him in line with government policy. It was a court case that led to the great crisis of Alan Brodrick’s political career. The Shercock-Annesley Case led to a question of whether or not the House of Lords in London was the final court of appeal in Irish legal cases. Brodrick did his best to calm down the passions the case raised. He warned the Irish House of Lords to be very careful, but the Lords pig-headedly made it clear that they thought the IRISH House of Lords should be the ONLY court of final appeal for Irish cases. In 1719 the Westminster parliament curtailed the powers of the Irish parliament by passing the notorious Dependency of Ireland on Great Britain Act or ‘Sixth of George I‘. this act remained in force until 1782. Alan Brodrick was blamed for this act, although he had sternly advised the Irish Lords not to pursue their confrontational policy. Alan Brodrick was a political Whig, supporting the Williamite settlement. He also controlled the nearest thing to a political party in the Irish House of Commons, the ‘Cork interest’ (also called the ‘Boyle interest’ due to the Boyle family’s participation, or ‘Brodrick interest’). This grouping didn’t resemble modern political parties, but was a looser grouping. In reality, Alan Brodrick was a parliamentary undertaker – that is he undertook to produce the required number of votes to get the government’s legislation through the Commons. Alan Brodrick’s great rival in parliament was the fabulously wealthy William Connolly, who also touted for the job of government parliamentary undertaker. The two men had an often bitter relationship. William Connolly eventually won the parliamentary battle, going on to build the magnificent Castletown House in County Kildare as a testament to his success and wealth. Sadly, Alan Brodrick invested in Peper Harrow, an estate in Surrey, to which his successor as Viscount removed himself and his heirs. The Irish Parliament that Alan Brodrick knew met in Chichester House in Dublin. The old parliament house was replaced by Sir Edwards Lovett Pearce’s masterpiece from the 1720s. All these posts allowed Alan Brodrick to accumulate or acquire lands in several counties, but mostly in County Cork, adjoining his father’s lands. His three successive marriages, to Catherine Barry, Lucy Courthorpe and Anne Hill, gave him additional family and political connections and two sons – St John Brodrick born to Catherine Barry died just months before his father, and Alan, born to Lucy Courthorpe, would outlive his father as Second Viscount Midleton. Alan Brodrick, first Baron Brodrick of Midleton, and first Viscount Midleton, died in August 1728, a few months after his son, St John, had died. He was succeeded by his second son,Alan, second Baron Brodrick of Midleton and second Viscount Midleton. In 1920, William St John Fremantle Brodrick, the ninth Viscount Midleton was elevated as first Earl of Midleton, and his son, George St John Brodrick, became the second Earl and tenth Viscount in 1942. The earldom became extinct with the death of George in 1979, but the viscountcy and baronage survived, transferring to a cousin. The titles continue today with the Alan Henry Brodrick, 12th Baron Brodrick and 12th Viscount Midleton, who has a son to succeed him. Castlemartyr at dusk – the south front of the old castle consists of the tall medieval tower-house on the right and the lower early seventeenth century manor house with its three vast chimneys. The tall gable wall on the left indicates the size of the roof of the old manor house. The manor house was probably added by Edmund FitzJohn FitzGerald between 1611 and 1641. With Halloween fast approaching there may be a tendency in Ireland to bemoan the Americanisation of the ancient Irish festival of Samhain. However this post will recount details of events in Castlemartyr that might suggest superstitions could be manipulated for other purposes, even as early as the first decades of the seventeenth century. An Englishman travelling about Ireland in the 1620s befriended Charles McCarthy, later created Viscount Muskerry in 1628. McCarthy, a major Gaelic landowner in County Cork, and a Catholic, was the owner of Blarney Castle. He was well connected and no doubt regaled his visitor with tales of the stone built into his castle that conferred eloquence on those who kissed it. Whether it was the present Blarney Stone or not is open to question. McCarthy may have been suspicious of the Englishman’s tour – was he a spy sent to identify vulnerable estates that could be seized by the Crown and granted to English planters? Taking the visitor on a tour, McCarthy took him first to Castlelyons to meet the young Lord Barrymore – a scion of the Anglo-Irish Barry family who had married a daughter of Richard Boyle, Earl of Cork. From Castlelyons, the travellers went towards Youghal, but with darkness approaching, they stopped at Castlemartyr for the night. In those days Castlemartyr was the residence of Edmund FitzJohn FitzGerald, the son of the last effective Seneschal of Imokilly who had died in confinement in Dublin Castle in 1589 just before the order for his release arrived from London. Edmund was only about eighteen months old when his father died. However, despite the fact that his father had twice rebelled against Elizabeth I in the space of ten years, the family estate at Castlemartyr was not confiscated. So, when Edmund came of age about 1610/1611, he inherited his father’s estate. It was almost certainly after this time that Edmund modernised the old castle by adding a modern manor house to his tower house. Following a grand meal, the guests were escorted to their chambers. Unusually, instead of being housed in the same room, the Englishman was given a room of his own, with a large window overlooking the park. Having got himself undressed, the visitor, locked the door and climbed into his comfortable bed, and extinguished his taper. A low fire in the grate was all that lit the chamber. Some time later, the visitor’s sleep was interrupted by a noise. It emanated from the direction of the door into the room. But the door was locked but someone clearly tried to gain entry into the bedchamber. Footsteps sounded outside, departing from the door. Imagining that he was about to be murdered, the visitor cowered under the bedclothes awaiting his fate. All was quiet again for a time, the dying embers of the fire cast eerie shadows around the room. Reassured that the door was secure, the Englishman dozed off again. The scale of Castlemartyr is indicated by the size of the children in the photo. Note how the manor house has its windows on the upper floor. It happened again…..footsteps outside his chamber, another attempt to open the door. This time more violently – the terrified Englishman was convinced now that somebody meant to do him harm. After all this was a Papist Irish household and he was a good Protestant Englishman. He cried out to the intruder but got no response. A sound of laughter, followed by receding footsteps suggested that the intruder had departed. By now the visitor was very worried. He reached for his taper and took it to the fire to light it from the last embers. This feeble light was to be his comfort for the rest of the hours of darkness. Wide awake now, and peeping from beneath the bed cover the Englishman contemplated his own, possibly immanent, mortality. Some time later, perhaps an hour or two, there was a noise at his window. It seemed as if someone was tapping on the glass. But that was impossible – the chamber was on an upper floor! The tapping stopped and all was quiet again. By now the taper had burned very low and soon it would go out. Then a shadow appeared on the ceiling, a figure seeming to reach into the chamber to open the door from inside. By now the taper was extinguished and the only remaining light came from the dying embers of the fire. Once again footsteps sounded outside, this time very faint. Once again the door rattled as someone tried to gain entry. It was too much for the petrified visitor, who spent the rest of the hours of darkness crouched under the bed, wrapped in a sheet. As soon as it was daylight, he got out, dressed quickly and opened the door to head out. The household was about to have breakfast, but the Englishman begged Charles McCarthy to depart with him immediately and speed on to Youghal. Despite McCarthy’s protests, the Englishman’s fears prevailed and they left at once….. Brutal witch hunts seem to have been more common in Scotland, England, and the Continent than in Ireland. Religious disputes and land ownership were the principal concerns in Ireland, although Florence Newton of Youghal was prosecuted as a witch on September 11th 1661! This strange tale was recounted some years ago at a lecture given in the Hunt Museum, Limerick. The lecturer suggested that a number of factors made the tale interesting. A Catholic Irish gentleman escorted a Protestant visitor to the home of a long established Catholic gentry family with a rebellious lineage. This was a time when the Plantation of Ulster was under way. The Elizabethan Plantation of Munster was still fresh in Irish minds, and the English adventurers, like Richard Boyle, Earl of Cork, were known for their rapacious acquisition of land – from whatever source. Families like the McCarthys of Muskerry and the FitzGeralds of Imokilly were wary of these interlopers. Was there a ghost in Castlemartyr that night? Blarney Castle was the seat of Charles McCarthy, who may have recounted the tale of the stone that granted eloquence…. It seems likely that, with or without the prior knowledge of Edmund FitzGerald, members of the household at Castlemartyr tried to frighten the English visitor and discourage him from giving a good account of his visit, thereby discouraging any possible ‘claims’ by an English planter on the Castlemartyr estate. The ‘haunting’ of Castlemartyr by a poltergeist that night seems to have been a defensive mechanism by the household. In an age of superstition, when women were persecuted in large numbers as witches, this was a highly successful strategy by the FitzGeralds of Castlemartyr. It is interesting that this tale appears to be the earliest example of ‘trick or treat’ known in an Irish context! Midleton College Founded 1696. This inscription over the great door of the original block of Midleton College is both accurate, and disingenuous. The school was indeed founded by Elizabeth Villiers in 1696, but the building itself didn’t exist at the time. Indeed, the original school house was only completed in 1717 – over two decades after the indenture of foundation was issued by Elizabeth Villiers. There are three questions to answer regarding Midleton Endowed School, as it was originally called. First, what prompted the foundation of the school in 1696? Secondly, what caused such a long delay between the foundation of the school and the completion of the school building; in 1717, when the Rev George Chinnery was appointed the first headmaster? Finally, what was the architectural source for the design of the original building? Midleton Endowed School was founded by Elizabeth Villiers Countess of Orkney in 1696. However the main building (on the right) wasn’t completed until 1717 under the direction of Thomas Brodrick of Midleton. The wing on the left was added in the second half of the 19th century. To understand the origins of Midleton Endowed School (its original name) we have to go back to 1660, and to the restoration of King Charles II. As soon as he was back on the throne, Charles sought to establish his younger brother, James, Duke of York, in a style befitting a royal prince. To this end, Charles granted James a huge Irish estate of over 95,649 acres which brought in almost £26,000 per annum. When James succeeded his brother as king in 1685 he retained this estate as a source of private income. However, James’s inept religious policies were sufficient to give his son-in-law, William of Orange, Stadholder of Holland, the opportunity to organize a successful invasion of England in 1688 with a fleet that was larger than anything the Spanish had ventured a century earlier. With the final defeat of Jacobite forces in Ireland, confirmed by the Treaty of Limerick in 1691, King William was in a position to award James’s private Irish estate to his wife, Queen Mary, who was the daughter of James and his first wife, Anne Hyde. It’s intriguing to think that some of the rents from the townland of Youngrove near Midleton may have contributed to the construction, or decoration, of Kensington Palace, which was being built at the time. It was at Kensington that Mary died in 1694 having first extracted a promise from her husband that he would give up his only English-born mistress, Mary’s childhood companion, Elizabeth Villiers. On Mary’s death in 1694, her sister, the Princess Anne, might have expected to inherit her father’s Irish estate. However, William, wilful as ever, granted the estates, along with a Scottish title, to his former mistress Elizabeth Villiers, perhaps in acknowledgement of her past services to him, as he decided to end all intimate associations with her. Elizabeth Villiers was now a rich woman in her own right, and a prize for any man that married her..
Elizabeth Villiers, Countess of Orkney, was a childhood companion of Princess Mary, and later mistress of William of Orange, Mary’s husband. Elizabeth founded Midleton Endowed School in 1696. This vast grant to William of Orange’s former mistress infuriated both the Irish and English parliaments, which wanted to sell off the lands to pay down the public debt. And therein lay the rub. Elizabeth, now Countess of Orkney, soon afterwards married to George Hamilton, who became known as Earl of Orkney, in right of his wife. Elizabeth needed the money from the rents to keep her in style appropriate to a noblewoman. She proposed to mollify opposition to her good fortune by using some of her Irish lands to endow a new school in Ireland. This move may have been designed to get the Irish House of Commons on her side against the English House of Commons. To this end, before her marriage to Hamilton, Elizabeth entrusted her Irish estate to her brother, Edward, Viscount Villiers, and to one of William’s privy councillors, Thomas Brodrick of Midleton. The latter was the eldest surviving son of Sir St John Brodrick, the Cromwellian soldier granted the lands of Corabbey in 1653, renamed Midleton in a charter of 1670. A year later, on 23 October 1696, Edward Villiers and Thomas Brodrick conveyed over 1,882 acres in the County Cork baronies of Kinnelea and East and West Carbery to the lawyer Alan Brodrick of Midleton, and to his brother in law, Laurence Clayton of Mallow. These men were now the trustees of the lands Elizabeth Villiers had set aside to endow her newly founded school. Alan Brodrick was, of course, the younger brother of Thomas Brodrick, one of the two trustees of Elizabeth’s great Irish estate. Alan Brodrick (1656?-1727), 1st Viscount Midleton from 1717. He was the key legal advisor to Elizabeth Villiers during her struggles to found Midleton College. A Speaker of the Irish House of Commons, Brodrick became Lord Chancellor of Ireland in 1715. All of the above suggests that Brodricks of Midleton seem to have been involved in the whole affair from the start. In fact, they even offered the site for the new school in their town of Midleton, carving out a totally new townland, called School Lands, from their townland of Town Parks. This ingenious measure kept the newly founded school firmly outside the jurisdiction and control of the Corporation of Midleton. In October 1710 they finally felt the endowment was sufficiently secure to permit them to lease some of the lands to Francis Daunt, gentleman, for a fine of £300 and a yearly rent of £100. The lease was renewable for three lives, subject to perpetual renewal on payment of a fine of £25 for each life. In 1712 remaining portion of the lands were leased to Thomas Hodges and William Ware and their heirs for £100 per annum. The perpetual renewal clause was the same as that granted to Daunt. Thus the lack of funds, due to the lack of any income from the endowment, had prevented Thomas Brodrick from commencing construction until sometime after 1710, perhaps even after 1712. The original Midleton Endowed School (centre and right) is built entirely of locally quarried limestone. The central windows in each wing were blocked at some stage. The single largeschoolroom was the large room lit by the two arched windows. The circular upper windows light the dormitory. The original cupola over the centre was removed before 1750. On the left is the later 19th century wing with brick window surrounds. The foundation indenture of 1696 also stipulated that the school master and ushers should not be appointed until the building was complete, ‘or sooner as they [the Governors] shall see occasion’. The appointment of Rev. George Chinnery MA as Master on 21 August 1717 suggests that the school was ready to accommodate the Master and his family, as well as the ushers, who were appointed at the same meeting. As an aside, the carpenter Benjamin Griffin was also granted extra payment for wainscoting the school room. All this shows that Midleton Endowed School wasn’t actually built until the second decade of the eighteenth century. And what of the school’s architecture? Who designed it, and what were the sources of the building’s design? As noted above, Thomas Brodrick was charged in the foundation indenture with framing models. That is, he was to draw up the plans for the building. Yet, Brodrick isn’t listed as an architect on the Irish Architectural Archive’s comprehensive online Dictionary of Irish Architects. As a gentleman he certainly had some acquaintance with, and perhaps a considerable knowledge of, architecture, but it seems likely that he may have had some professional help in drafting the design of the building. One possible architectural advisor may have been the Scot, John Curl, who was reworking Beaulieu near Drogheda. His work there was done for the Tichbourne brothers who were, like the Brodricks, staunch supporters of the Williamite settlement. It’s worth noting that the plan of the somewhat earlier Beaulieu bears some resemblance to that of Midleton School. Clarendon House, St James’s, London, was designed by Roger Pratt for Edward Hyde, 1st Earl of Clarendon. The Earl of Clarendon was the grandfather of Queen Mary and Queen Anne. In the 1664, King Charles granted Clarendon an eight-acre plot of land in St James’s in London. On this Hyde built a grand and very influential mansion – Clarendon House. Designed by Roger Pratt, and completed in 1667, Clarendon House was built to a plan that followed Pratt’s belief that the family apartments should be separated from the guest apartments at the opposite end of the house by an apartment of parade. The plan was laid out as a wide H with the transom, or crossbar, being the main entrance and garden facade. The house was a double pile (at least two rooms deep) and consisted of two equal storeys over a basement, with an attic lit by dormer windows above. The main section of Clarendon House, the ‘transom’, was of nine bays in length. The side wings, of the same height as the main section, were three bays wide on their principal facades, and accommodated the family on one side and guests on the other. The whole composition was topped off by a cupola situated on the roof directly on the central axis of the building above the main entrance. This may have lit a staircase hall. Pratt’s design for Clarendon House was a Carolean baroque scheme which influenced a number of large houses in England until the 1720s, the best known example being Belton House in Lincolnshire (built 1685-1688). One advantage of Pratt’s composition was that it could be enlarged or reduced in size to suit the pocket of a patron. Note that the term Carolean is derived from Carolus for King Charles II and refers to the style of baroque architecture and decoration employed in both Britain and Ireland after the Restoration in 1660 until the 1720s when the Palladian revival took hold. Clarendon House was sold off by Edward Hyde’s heirs in 1675 to Edward Monck, 2nd Duke of Albemarle, whose spendthrift ways obliged him to sell it in 1683. Bought by a consortium of property developers, including Sir Thomas Bond, Clarendon House was in such a poor state that it was promptly demolished and the site used for developing Dover Street, Albemarle Street and, of course, Bond Street between 1684 and 1720. Given that Elizabeth Villiers’ mother, Frances, was the governess of the Princesses Mary and Anne, and that Elizabeth was herself Lady in waiting to Mary when she married William of Orange, it is likely that this link to the Hyde family and Clarendon House influenced Thomas Brodrick’s scheme of architecture. One is left wondering if Elizabeth Villiers herself might have suggested Clarendon House as a model for Midleton School. It should be noted that Elizabeth’s sister, Mary, married William O’Brien, 3rd Earl of Inchiquin, who owned Rostellan near Midleton. Inchiquin was one of the first school governors, and a cousin of Henry Boyle of Castlemartyr, who was another governor of the school. Midleton School was also laid out as two equal storeys over basement on the Clarendon House H-plan. The transom presents the main (west) facade to the visitor and to the grounds (east front) with the ends of the flanking accommodation wings located to the north and south. These wings present three window bays to the front and back, as at Clarendon House, although the central windows are now blocked up. Obviously one wing accommodated the Master and his family, while the other accommodated the ushers with the pupils boarding upstairs. The single schoolroom occupied the transom, with additional dormitory accommodation overhead. It is worth noting that the transom has a frontispiece in the centre of each facade, again as at Clarendon House. That on the west facade provided the main entrance while that to the east held a large arched window to provide morning light for the schoolroom. The principal door is flanked by two high arched windows and the upper storey has round windows, or oculi. Such round windows were used on certain buildings constructed in the English baroque style in the period 1790 to about 1720, for example on Christopher Wren’s portion of Hampton Court Palace, and the later Cannons House in Middlesex, and Appuldurcombe on the Isle of Wight. The north and south facades were designed with a four-bay frontispiece flanked by two bay setbacks. Again, the inner bay of each setback has had the windows blocked up. These blocked up windows present a difficulty. Were they originally blind windows inserted to provide symmetry and interest to the facades, as at Belton? If so it seems very odd that they are now totally flush with the wall. There really would have been no point in making the recesses flush with the outer plane of the walls at a later stage. It seems much more likely that these windows were original openings that were blocked up during the late 1820s under the supervision of Joseph Welland, a native of Midleton who was then the architect for the Commissioners of Education. It seems likely that Welland may have remodelled the original entrance door as well. One other detail requires mention, although it is now absent. In his book, The Ancient and Present State of the County and City of Cork (1750), Dr Charles Smith gives a description of Midleton School in which he mentions a cupola on top of the building which had been taken down some years previously. There is no reason to disbelieve Smith since he appears to have been quite diligent in his researches. Since no copy of the school’s original plan or elevation has yet come to light, we must ask what was the purpose of this cupola? At Clarendon House the cupola seems to have provided light for the staircase below. If the cupola on Midleton School was a glazed lantern, it may have been designed to draw more light into the dormitory on the upper floor. However, there exist in England examples of open arched cupolas on some houses of the period. These seem to have been intended to add dramatic flourish to the appearance of the building, emphasising the central axis. Either way, the mystery of the Midleton School cupola remains to be resolved, but whichever style of cupola was adopted it provided a dramatic flourish to emphasise the central axis of the building, just as the cupolas did on Clarendon House and on Belton and other houses built under the influence of Pratt’s design between the late 1660s and the 1720s. Appropriately the school was approached via Charles Street, named after the monarch who granted the charter which established the Manor of Midleton and incorporated the Borough of Midleton in 1670. Charles Street, now Connolly Street, seems to have been laid out on its current triangular plan to focus on the school built between 1710 and 1717. To emphasise the baroque influence even further, the view from the school door would originally have taken in the large steeple attached to the previous St John the Baptist’s Church, a steeple that held a peal of six bells when Charles Smith visited in 1750. Thus the baroque influence wasn’t simply confined to the school building but reached out towards the town itself, although it was never fully developed there! With five primary schools and four secondary schools, Midleton is known as a centre of education in East Cork, especially when one recalls that St Colman’s Community College also supplies opportunities for post-secondary education. 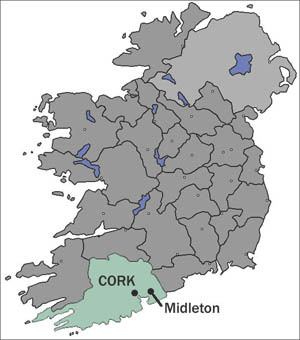 This educational concentration grew from the endowment of 1696 which led to the creation of Midleton Endowed School, now entering its tercentenary of teaching as Midleton College.